The official trailer for Summit Entertainment’s John Wick: Chapter 3 – Parabellum kicks off with Ian McShane saying, “And away we go.” That leads to scenes of John Wick (Keanu Reeves) on the run with his dog at his side. (That dog better survive this third film of the franchise!) There’s a $14 million bounty on John Wick’s head, dozens of trained killers on his tail, and yet the odds are still 50/50 he’ll survive. The action-packed trailer features clips of Keanu Reeves in hand-to-hand combat and riding a horse through traffic while shooting an assassin on a motorcycle. He then teams up with Halle Berry and German Shepherds to take on even more lethal bounty hunters. Joining Keanu Reeves for the chapter three are Laurence Fishburne (Mission: Impossible III), Ian McShane (American Gods, Pirates of the Caribbean: On Stranger Tides), Lance Reddick (White House Down), Mark Dacascos (Lucky Day), Asia Kate Dillon (Billions, Orange is the New Black), Saïd Taghmaoui (The Missing), Jerome Flynn (Game of Thrones), Jason Mantzoukas (The Long Dumb Road), Tobias Segal (The Good Wife), Boban Marjanovic, and Anjelica Huston (The Royal Tenenbaums). The behind the scenes team includes Dan Laustsen, editor Evan Schiff, production designer Kevin Kavanaugh, and costume designer Luca Mosca. 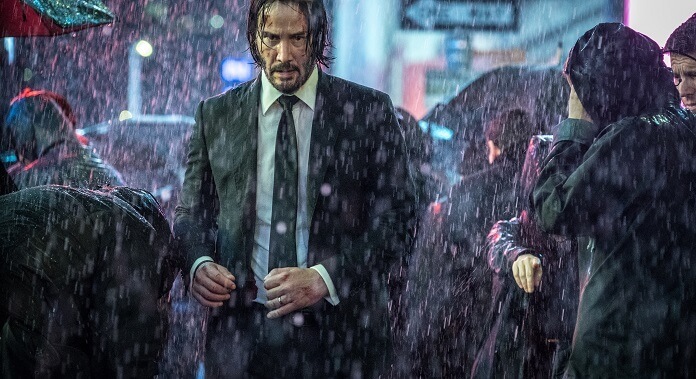 John Wick: Chapter 3 – Parabellum will open in theaters on May 17, 2019.